Alleviate competition for more expensive clothing and/or fad clothing. 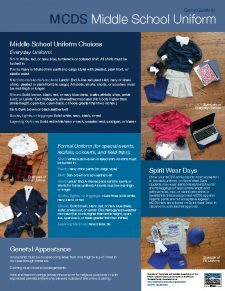 Help the student get ready for school in the morning with as little conflict over clothing as possible. MCDS students enjoy Friday Spirit Wear days when they can wear non-uniform clothing with an MCDS spirit wear item. MCDS students also enjoy themed clothing days throughout the year during Homecoming Week, Middle School Spirit Week, and Spring Carnival. 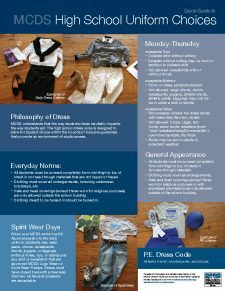 The complete and detailed description of the MCDS Uniform Code can be found in the MCDS Student/Family Handbook. 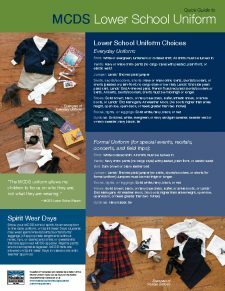 Lands’ End MCDS Webpage –Use this link and the MCDS Preferred School Number (900035213) will automatically be applied to your order. Lands’ End will donate up to 5% of your purchase to support our school.